I love pumpkin as you all well know by now. That’s why it’s odd that I only make it in the fall and mostly only on Thanksgiving. I suppose that’s what keeps the ingredient so special plus it’s hard to find the pumpkin puree at the supermarket after Thanksgiving. I always buy a few extra cans of pumpkin so when that pumpkin urge hits I am ready. I like to have a pasta dish every year at my Thanksgiving dinner. Usually I make my cremini mushroom and pumpkin lasagna. 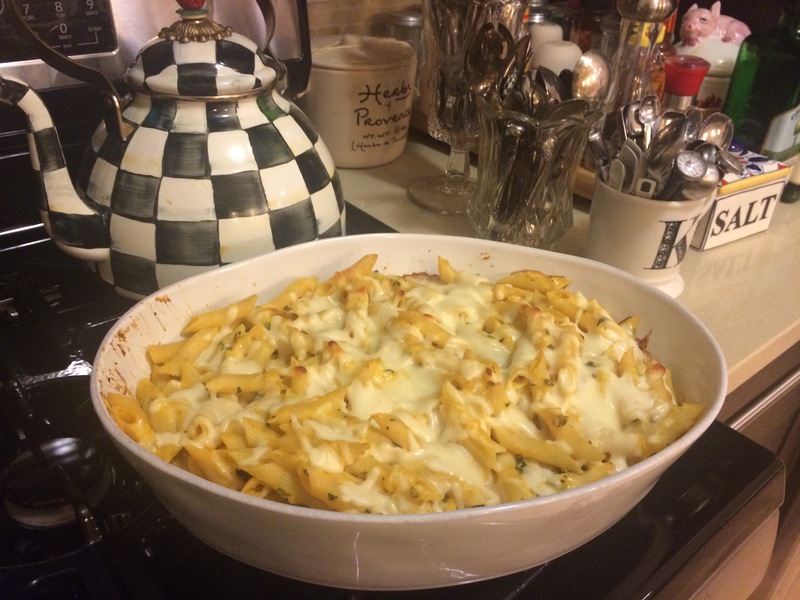 This year I am making this delicious baked pumpkin penne. I am going to make it Monday but not add the cheese on top till Thursday and freeze. I will take out of freezer Wednesday night and Thursday will put cheese on top and bake till bubbly. I will keep aluminum foil on it to re-heat and take off foil for last 10 minutes. To re-heat it will probably be 1/2 hour with aluminum foil on for the first 20 minutes. It should start bubbling and put a fork right in the middle to test for readiness. If it needs more time and is getting too browned put foil back on and continue heating it up. You will cook it at 350 degrees as directions state. One of the best things about baked pasta dishes is that they freeze so well. Making them some of the easiest dishes to prepare ahead. This whole thing including chopping up sage took maybe 1/2 hour to prep. My kind of dish! as a side dish it will serve about 10-12, as a main dish figure about 8. In a large bowl, combine cooked penne, pumpkin, 2 cup- 3 cups mozzarella, heavy cream, sage, salt and garlic powder. Stir to combine. Taste for salt. Transfer mixture to a greased or well sprayed 3 quart baking dish and sprinkle with remaining 1 cup mozzarella. Bake 20 to 30 minutes or until cheese is bubbly and melted. Since I was freezing I pulled it out after 20 minutes, cooled it down and wrapped it tightly and put in freezer. I love pumpkin as you all well know by now. That’s why it’s odd that I only make it in the fall and mostly only on Thanksgiving. I suppose that’s what keeps the ingredient so special plus it’s hard to find at the supermarket after Thanksgiving. I always buy a few extra cans of pumpkin so when that pumpkin urge hits I am ready. I like to have a pasta dish every year at my Thanksgiving dinner. Usually I make my cremini mushroom and pumpkin lasagna. 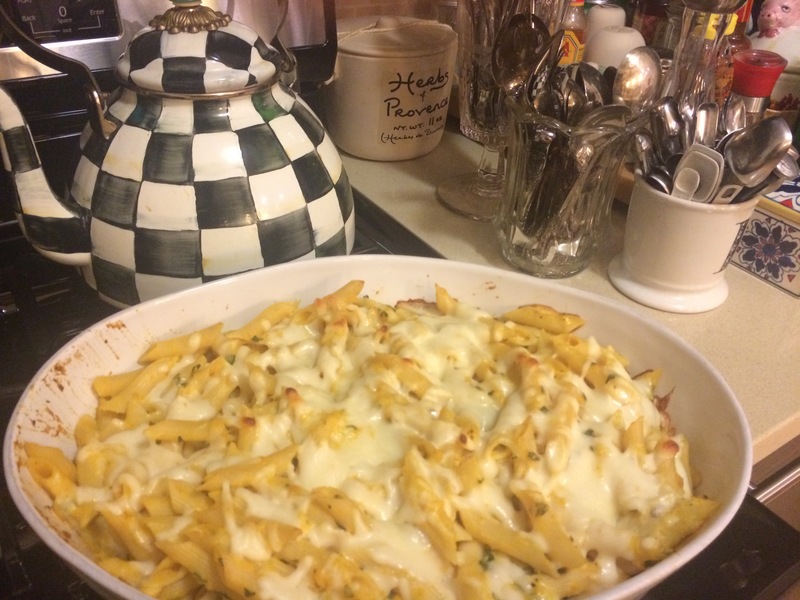 This year I am making this delicious baked pumpkin penne. I am going to make it Monday prior to Thanksgiving and cook and freeze. I will take out of freezer Wednesday night and Thursday will pop in oven just to re-heat. I will keep aluminum foil on it to re-heat and take off foil for last 10 minutes. To re-heat it will probably be 1/2 hour with aluminum foil on for the first 20 minutes. It should start bubbling and put a fork right in the middle to test for readiness. If it needs more time and is getting too browned put foil back on and continue heating it up. You will cook it at 350 degrees as directions state. Bake 20 to 30 minutes or until cheese is bubbly and melted. Since I was freezing I didn’t put cheese on top . I just baked the pasta without cheese on top for 20 minutes and I pulled it out after 20 minutes, cooled it down and wrapped it tightly and put in freezer. When it is time to re-heat I will remove from freezer Wednesday afternoon let it come to room temperature on Thursday afternoon and put extra mozzarella on top at that time. Bake at 350 degrees for probably another 1/2 hour or so till cheese gets bubbly and browned as I said in the introduction here. I like to have a pasta dish every year at my Thanksgiving dinner. Usually I make my cremini mushroom and pumpkin lasagna. This year I am making this delicious baked pumpkin penne. I am going to make it Monday and cook and freeze. I will take out of freezer Wednesday night and Thursday will pop in oven just to re-heat. I will keep aluminum foil on it to re-heat and take off foil for last 10 minutes. To re-heat it will probably be 1/2 hour with aluminum foil on for the first 20 minutes. It should start bubbling and put a fork right in the middle to test for readiness. If it needs more time and is getting too browned put foil back on and continue heating it up. You will cook it at 350 degrees as directions state.